This thread’s objective is to discuss the ULMFiT implementations in different languages and share our roadblocks and approaches. This thread is huge, and can be overwhelmed, but there is an easy way to get started. Dataset https://www.kaggle.com/mustfkeskin/turkish-wikipedia-dump Doing a literature survey to get SOTA LMs’ perplexity scores. Initial perplexity score with spacy tokenizer is 80+ range. SentencePiece is most likely to be more suitable for Turkish. This is a Wiki, please add you name (via hyperlink not @user_name) and the language you are working on by alphabetical order. Feel free to form a group to discuss your language specific problems as well. use the best_save_name parameter during training to save the best model. Just in case you get a memory error message. Please run torch.cuda.empty_cache() to clear the cache and start the kernel again. I’ve made the top post a wiki so anyone can edit it. @jeremy Technically speaking, Chinese is one language but with two set of written characters (simplified and traditional). To be honest, I (and most of the people I know) use them interchangeably. Currently, I am using the same data set as @shoof and converted it traditional characters via mafan. Should I train the traditional only or both? Since it will take very long to train a model, your direction is highly appreciated. In English, the regional spelling differences are minor enough that I think (I could be wrong!) that usually people just train on “English” and don’t worry about whether it is US or British or Australian or Indian English. However, for US/British/Australian/Indian/etc., they all use characters from the same Unicode set – the same alphabet. A Latin “G” is unicode U+FF27, regardless of whether it’s Australian or Canadian. However, the Traditional Chinese for the first symbol in “country” (國) is unicode U+570B while the Simplified (国) is U+56FD. This means that whatever model you have is going to think that 國 and 国 are completely different words. Now, maybe mafan is clever enough to know all the mappings between Simplified and Chinese – I don’t know and it’s late enough that I’m not going to try to download and try to convert 國 to 国. If that is the case, then my non-Chinese-expert-self thinks it’s probably reasonable to just train on one. However, using a simplified corpus which has been translated via mafan seems like it wouldn’t buy you anything. If mafan is that good, then you could just use mafan translate the Simplified on the input and output and you’d be done. If mafan is not that good, then I would think you would need to have a Traditional corpus. It might also be – I don’t know – that there will be subtle differences in the words used in Simplified and Traditional corpuses. Just like there were words in the IMDB database which were not in Wikitext103, maybe there is e.g. a minor celebrity star in Hong Kong whose name has unusual characters which are not used commonly in China. So I would think that if you want to do Traditional, you should get a Traditional corpus, not just translate a Simplified corpus. My opinion, probably worth as much as you paid for it. @Moody and I are both Chinese speakers (her natively, me poorly!) so we’re familiar with the issue. It’s an interesting one and your husband’s analogy is a pretty good one. However any English analogy is going to have problems since this issue is fairly specific to logographic scripts. In the case of 国 it’s easy, since there’s a clear 1-1 reversible mapping. The problem is that not all characters have that. Technically speaking, Chinese is one language but with two set of written characters (simplified and traditional). To be honest, I (and most of the people I know) use them interchangeably. Currently, I am using the same data set as @shoof and converted it traditional characters via mafan. Should I train the traditional only or both? Since it will take very long to train a model, your direction is highly appreciated. Yeah so… it’s a shame you didn’t go the other way, I think, since IIRC every traditional char maps to a single simplified char, but not visa versa. So that would be more reliable. You can map a simplified corpus to traditional, but because the mapping isn’t unique, you need to use a language model (hah!) or at least n-gram frequencies to handle the ambiguities. According to opencc for example, they just map to the first match if there’s an ambiguity. I don’t know if hanziconv and mafan do the same thing - I wouldn’t be surprised if that’s all they did, unfortunately. I don’t think it’s going to matter too much however if you end up with a slightly-wrong corpus. Simplified Chinese characters are designed such that ambiguities are unlikely to be a problem in understanding language. So I’d guess you’ll be fine - but just be aware that the issue exists. FYI, my tokenization seems stalled after a while and I used chunk size = 24k as in the notebook. I’m using 5k instead and so far so good. Maybe worth noting in case you don’t have a powerful machine like the one Jeremy has! The 1-1 mapping thing really bothered me for a while too! I think simplification actually removed the “soul” of the language. Once gone, it’s not easy to get it back (maybe a NN mapping could be better?)! Well I love the simplified characters personally. I think it’s an extraordinary linguistic project that was done very well. Top Chinese writers throughout history have railed against the complexity of the character set. For a long time it was explicitly designed to maximize exclusivity of the educated class! If I wait longer (like the previous few times), I get an error message. I think @lesscomfortable had a similar problem but he used batch 5k and perhaps a more powerful paperspace instance. Would you recommend anything for this case? I don’t know much about garbage collection (reading it) or how the program keeps threads alive. Reducing batch size doesn’t seem to solve the memory problem. I also thought about creating and enabling a swp file, but even if there is Swp space, the processes wouldn’t move forward. My machine was 32GB RAM. I would suggest to keep on reducing the chunk size, eventually one will work (it did for me ). But also save your progress so you don’t lose everything when (if) it crashes. I divided my trn_set into 12 and run the tokenizator on each of them, thus saving my progress. But do not let go. The training part works fine if you can pass the tokenizer. 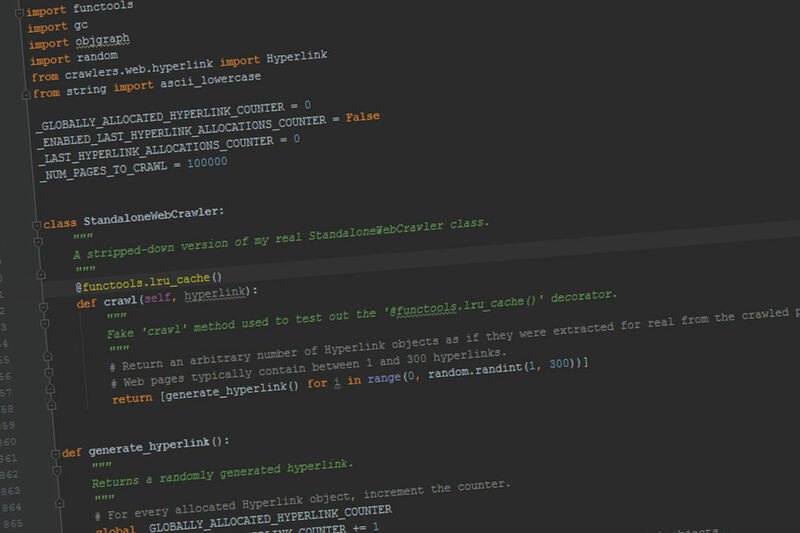 In this post, you will discover how I used various tools to track down a memory leak in my Python application under Windows! Thanks Jeremy. I tried the single-core version proc_all while increased chunksize and it has the same issue of stalling after n_iter * batch size * text size per batch > RAM. I think the lists were just getting too big and I’m going around the problem by doing what @lesscomfortable did to save the list every n iterations incrementally, and then concat all at the end. I started to attempt training a language model for korean as I planned to classify toxic comments. I am currently using Konlpy for the tokeniser but sentencepiece suggested by Jeremy looks interesting as well. I will try with what I have got at the moment first and update you. Thanks. A note to those folks building langage models: there’s no reason to go beyond 100 million tokens - in my experiments it didn’t help. So if your corpus is bigger than that, remove some of the smaller articles (for instance) until the corpus is down to that size. Really large corpuses are a pain to work with, and don’t have any benefits I saw. 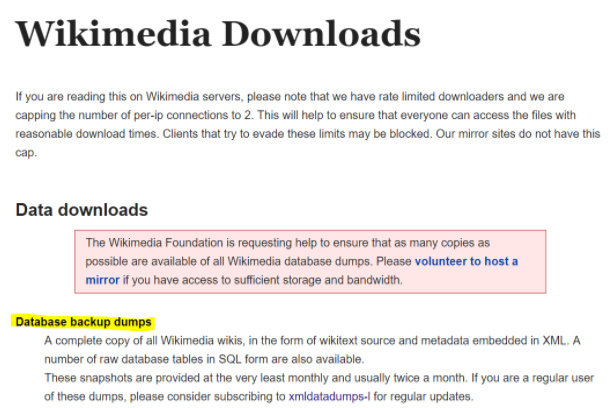 To help you to get started, here is the procedure to download data from Wikipedia. Hi everyone, I wanna work on Sanskrit Language but I am not finding useful sources to download the data from. Also there isn’t any suitable Tokenizer that I know of as of now. Please guide me to appropriate resources if somebody know. Also for the tokenization I am thinking to use Sentencepiece that @jeremy mentioned in Lesson 10. I have gone through the github page but I am unable to figure out how it works ( I am not good with programming and command lines … ) . If anybody has tried it out please shine some light on its usage.